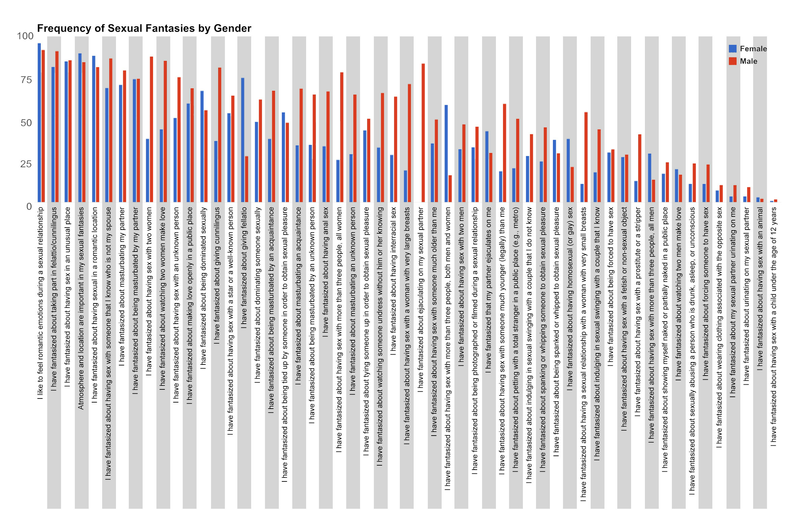 Reddit user IronyAndWhine made this graphic showing the frequency of 55 sexual fantasies by gender according to the study What Exactly Is an Unusual Sexual Fantasy? published on October 30, 2014, on the Journal of Sexual Medicine. It's an interesting look at human sexuality. Note: I modified the graphic for readability. According to the authors—Christian C. Joyal PhD, Amélie Cossette BSc, and Vanessa Lapierre BSc, of the Department of Psychology, Université du Québec à Trois-Rivières, Trois-Rivières, Québec, Canada—the "main goal of this study was to determine which SF are rare, unusual, common, or typical from a statistical point of view among a relatively large sample of adults recruited from the general population." They interviewed 1,516 adults (799 female; 717 male) on the internet, "who ranked 55 different sexual fantasies and wrote their own favorite sexual fantasy."